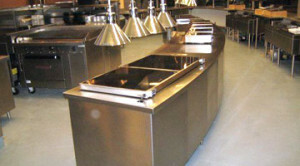 All flooring material expands and contracts with changes in temperatures. Only when it occurs at a rate significantly different than that of the concrete substrate underneath, though, does it lead to disbondment, delamination, cracks, bubbles and other deterioration. With Florock thermal shock resistant flooring & coatings, however, your worries are over. These ultra-high performance floor systems expand and contract at a rate very similar to that of the concrete slab below, helping to ensure that your seamless, hygienic industrial concrete floors function exactly as they should. You may have seen other flooring materials crack, crumble, bubble or melt before your eyes when exposed to thermal cycling or extreme temperatures, but not our seamless, thermal shock resistant flooring. These hard-working flooring systems, with their slip-resistant, antimicrobial and chemical-resistant properties, give you the same sanitary and easy-to-maintain finish day after day, regardless of your high-pressure steam cleaning, boiling liquid spills and other environmental factors. Even the punishing, higher temperature environment beneath industrial and commercial ovens is no match for our thermal shock resistant flooring. The tenacious bond goes on and on regardless of atmospheric changes—it’s hard to find a better industrial or commercial flooring value than the one you get with Florock. 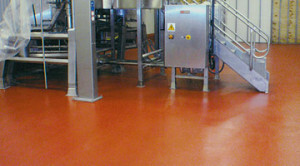 Where other flooring fails, these exceptional floor coating systems adapt and endure. Let our local Florock experts help you decide on the best thermal shock resistant flooring for your facility and your budget. In facilities where floors are steam cleaned or otherwise exposed to rapid, extreme temperature cycling, not just any industrial concrete floors will do. Standard floor covering materials typically cannot withstand exposure to excessive swings in temperature, without exhibiting signs of severe damage. Our thermal shock resistant flooring & coatings provide the solution, giving you an economical and long-lasting way to protect your floors from thermal shock. With thermal shock resistant flooring, these and other harsh environments are significantly less susceptible to the damage caused by dramatic changes in temperature.